Click on the image to enter a 360° scene at the foot of the lighthouse. Move your cursor or finger, depending on device, to turn around in the scene. Clicking on the “windows” will allow you to play/pause embedded movies. Hitting the Play button at the bottom will trigger commentary of this “amazing” experience. 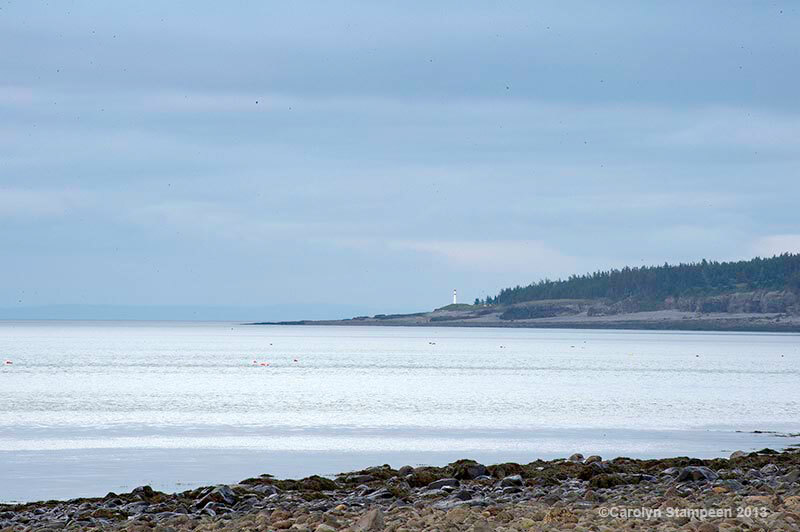 The Black Rock lighthouse can be seen from Harbourville. I had been wanting to visit it since I first saw it, but one hot day I was finally able to persuade the fellow. We left Berwick in hot sunshine and we were greated on the other side of the mountain with cool fog. It looked otherworldly as it swept off the water up the cliffs and it seemed the perfect time to check out that lighthouse, now invisible from this same spot. When we arrived at Black Rock beach, we parked our car in the sun and descended into another world as we climbed down to the beach. The closer to the water, the cooler the air, the more muffled the sounds. 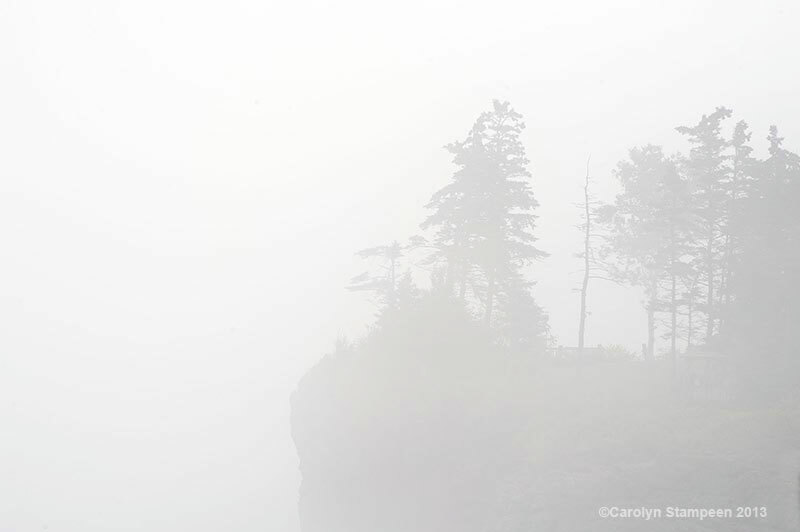 The fog was thick, it dispersed, it returned … it was a living thing moving around us, one minute enveloping us in white; the next, giving us glimpses of the world around us. I overuse the word “amazing” in the audio accompanying the 360° image above, but sometimes one is at a loss for a word that seems fitting. 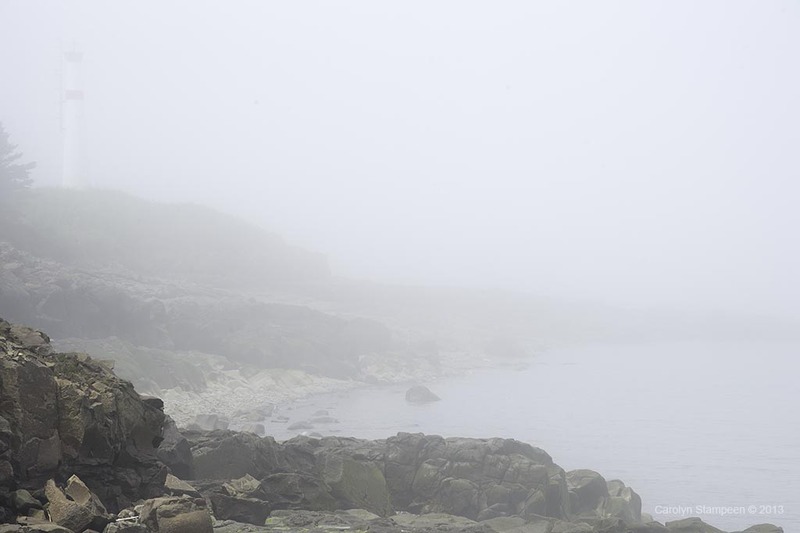 This is a beautiful location and fog can add an air of mystery. Safari renders the movies inside the 360° with black edges. This is not seen in other browsers. Firefox may have ticks in the commentary audio. This is heard when the same file is played with other players. This was the scene that greeted us in Harbourville. It’s difficult to imagine that only about 10 minutes away, over the mountain, the day is bright and hot. 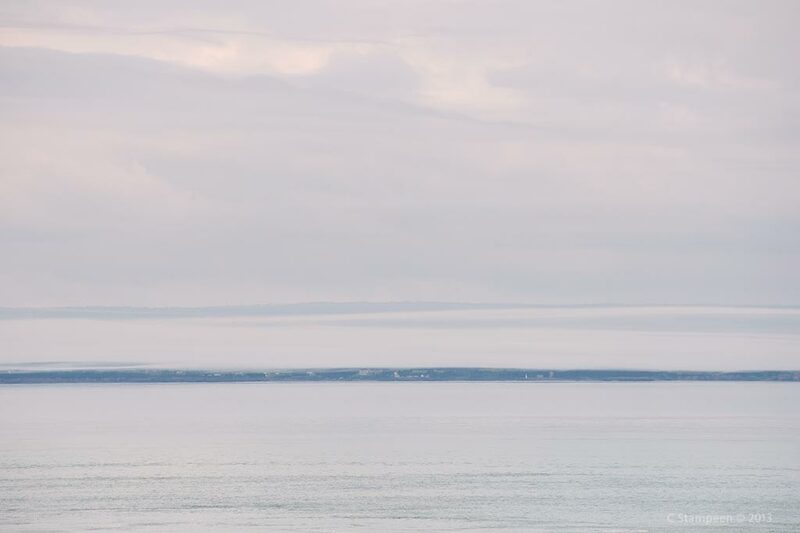 The lighthouse can be seen from Cap D’Or on clear days. 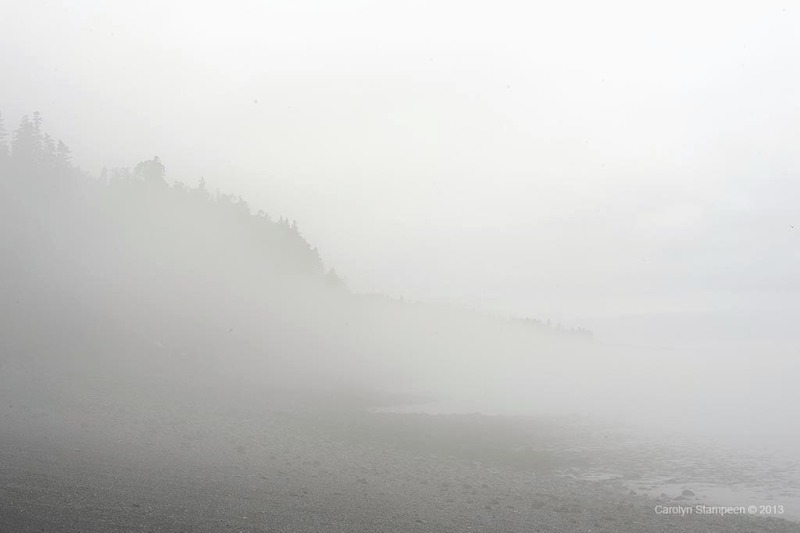 Here, a layer of fog is sitting over the coastline, but allows us a peek at the shore. The scene is tinted with the warm colours of a setting sun. 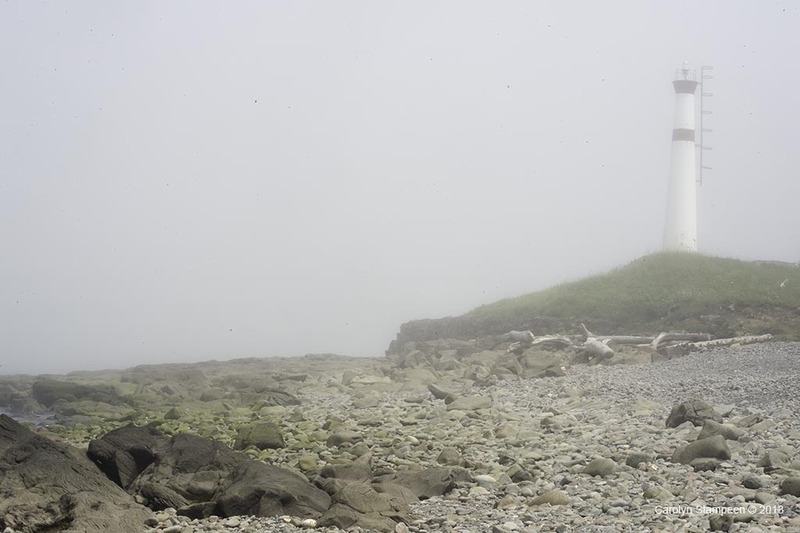 When we first arrived at Black Rock beach, the lighthouse was not immediately visible. It came in and out of view as the fog swirled around. This is a wonderful rugged beach and whether you just want to sit and just be, filling your lungs with clean air, watching the world exist, or climb along the beach, it is a lovely place to spend time. If wandering, as always, keep in mind that Fundy tides can come in more quickly than expected and can cut one off from easy escape if one is not mindful. It’s always a good idea to check tide times in advance. This entry was posted in Beach, Lighthouse and tagged Bay of Fundy, Blue Rocks, Lighthouse, Nova Scotia. Bookmark the permalink.